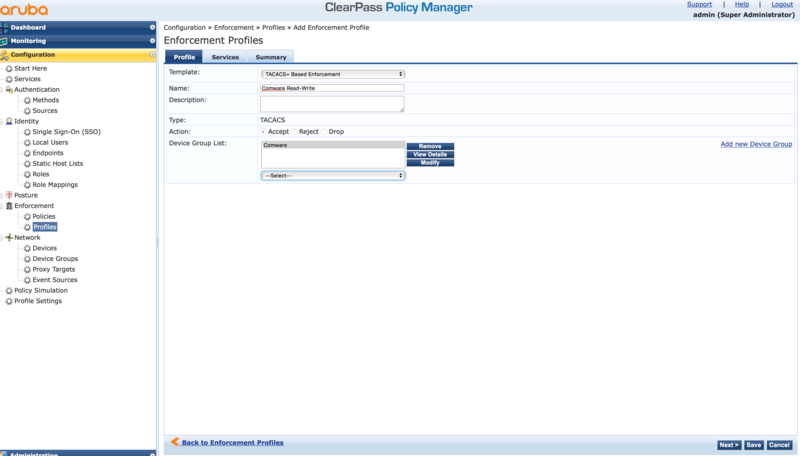 This post is all about operator login with ClearPass. I show the implementation of authenticating a network operator to Aruba Switches, Comware based switches, Aruba Controller and AirWave. For some devices, I will show the process with TACACS+. For those, which do not support TACACS+, I use radius authentication, which I describe in a later post. ClearPass has built-in TACACS+ support for various devices. 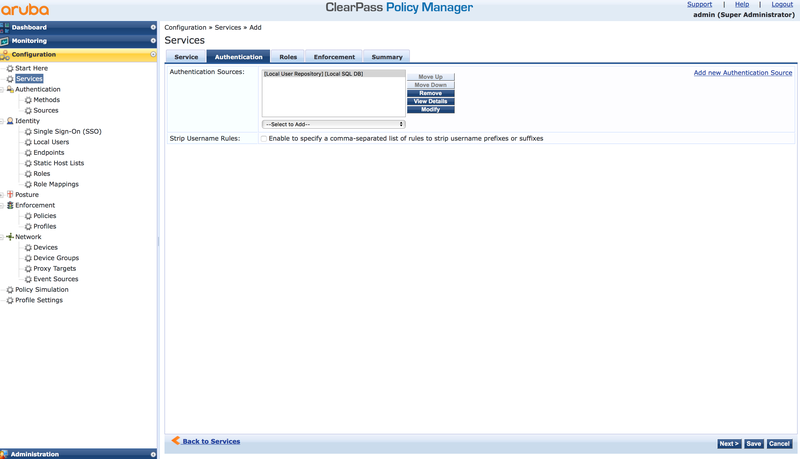 In the first part, I create a ClearPass configuration for general purposes. Afterward, I append rules to serve certain devices. I assume, ClearPass is installed and you know how to configure the basics. If you struggle with this, leave me a comment and can cover this as well in a future post. Afterward, click three times “Next” and save the new service. All other screens are default values, for the moment. The basics are configured. To authenticate all network operators on Comware devices with TACACS+ and ClearPass follow this paragraph. The first step is to prepare the Comware device to use ClearPass for TACACS+ authentication. On Comware based devices TACACS+ is called HWTACACS. 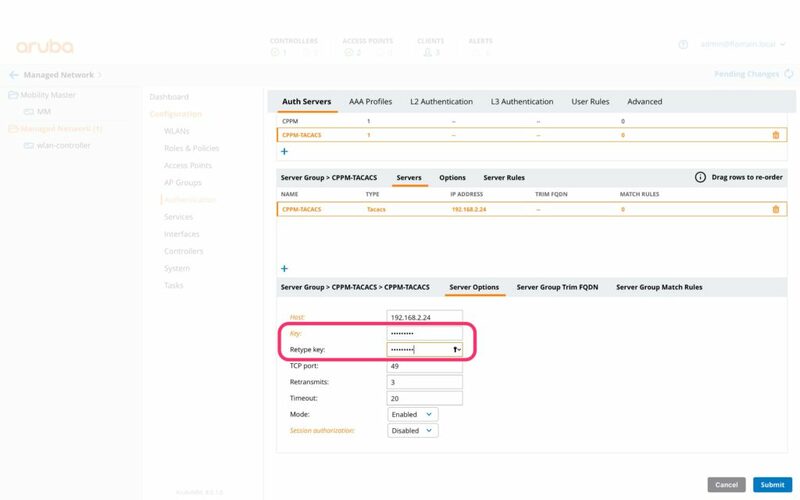 Log in to the device and make sure, that you did not configure your current connection type for TACACS+. 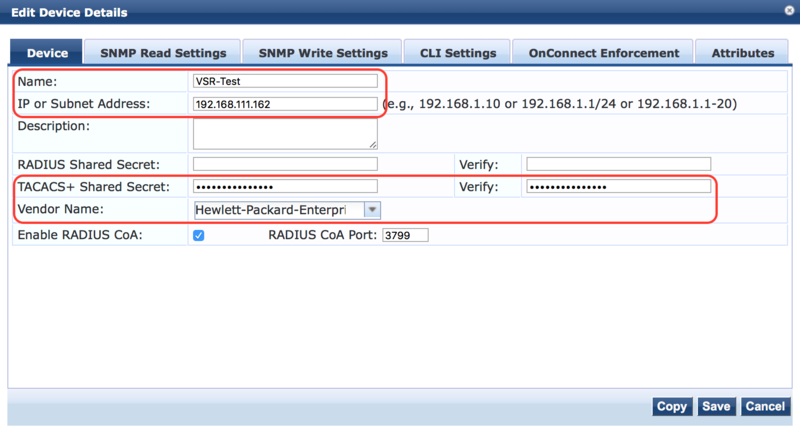 If connected with SSH do not configure TACACS+ for SSH, as you could possibly log out yourself from the device. This scheme is configured with the TACACS+ server 192.168.111.55 and the key “comcomcom” for authentication, authorization, and accounting. This scheme does not send the domain with the request, as the domain is not configured on ClearPass. 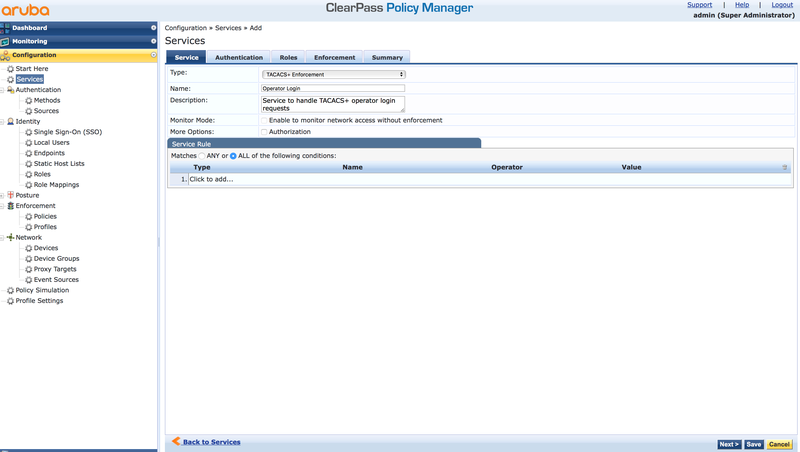 Every user, which uses this domain “cppm”, is authenticated with the ClearPass server. That’s all you need to configure on the device. Now, prepare some specifics for the authentication on ClearPass. So, head over to ClearPass. 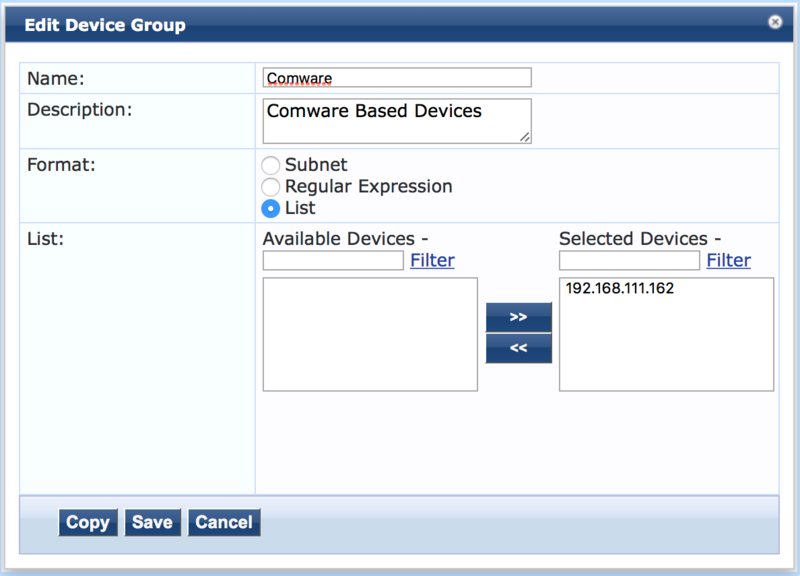 You have to configure the Name and the IP address. 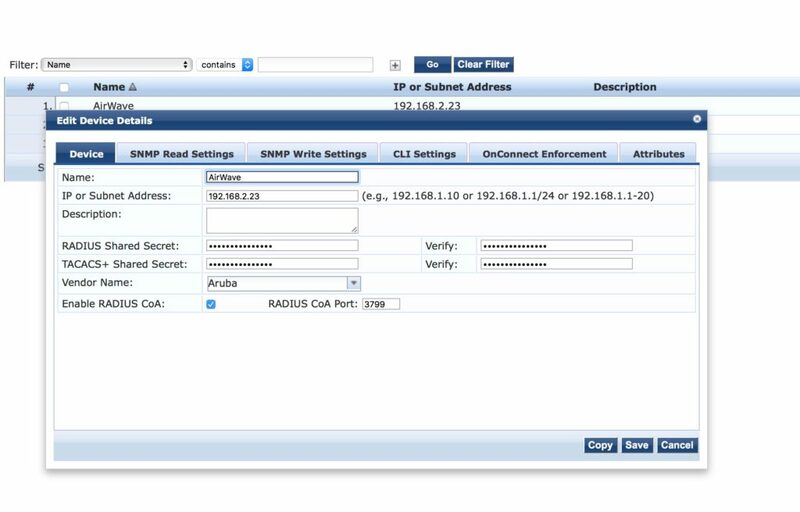 If you have a subnet with IP address, you can configure them as well. Configure the same shared secret as the key on the device. If those do not match, the communication between the device and the ClearPass will fail. If you have many devices of the same type, it makes sense to create device groups. 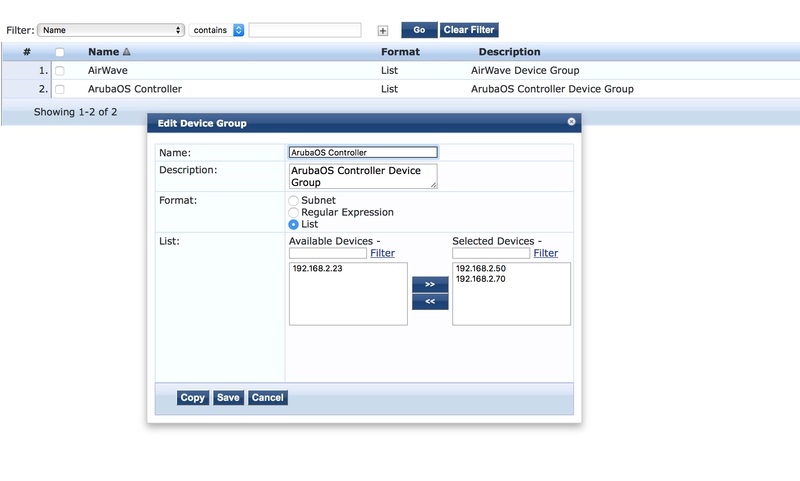 I use these device groups to send different TACACS+ responses to the different type of devices, like Comware, Aruba OS Switch, and ArubaOS WLAN controller. 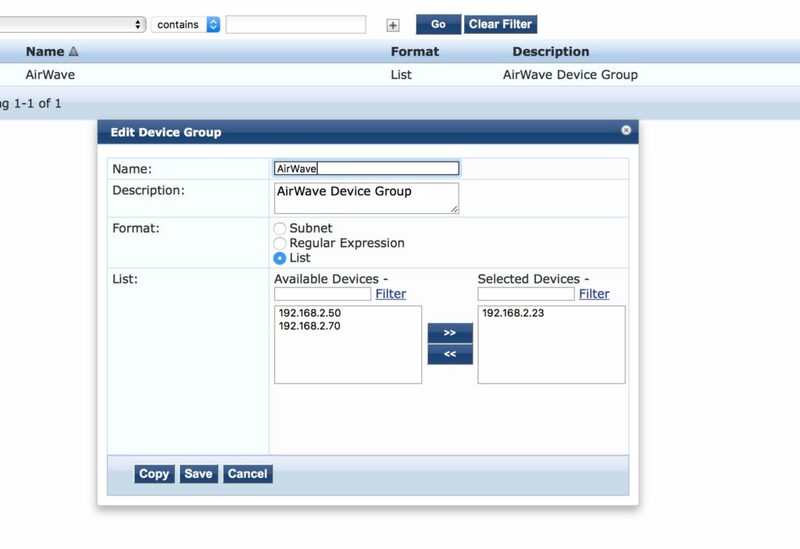 To select the devices, belonging to this group, I choose the “List” format, as this allows the selection of the device from the list of configured devices. you can also choose the “Subnet” format, which allows the definition of a subnet. 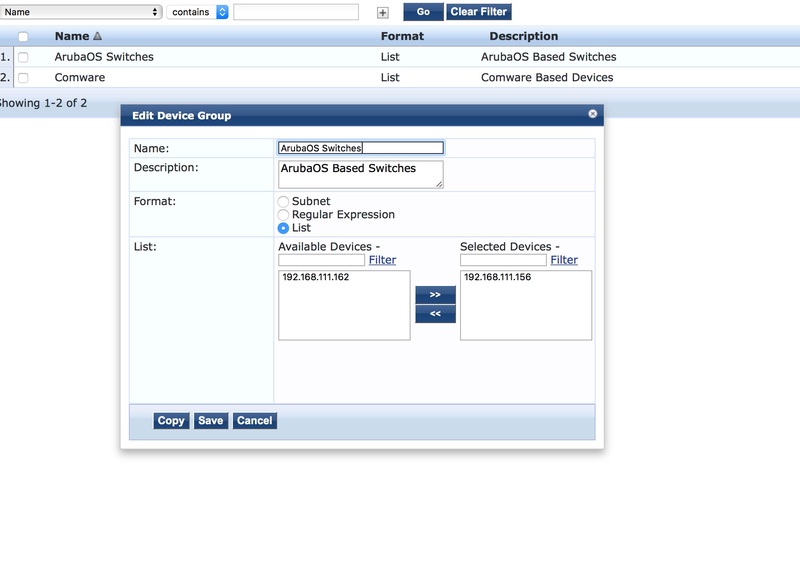 Makes sense, if all devices of the same type are within the same management subnet. I’ve never used the “Regular Expression” option, but this will gives you the most flexibility. All prerequisites are done and we can start with the service definition. The first step is the creation of the “Enforcement Profile”. 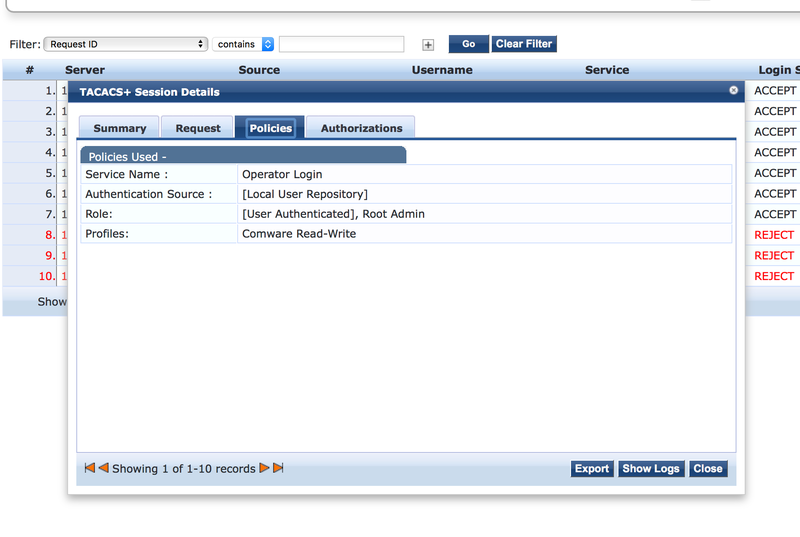 Go to “Configuration–>Enforcement–>Profiles” and click the “Add” button on the top of the page. 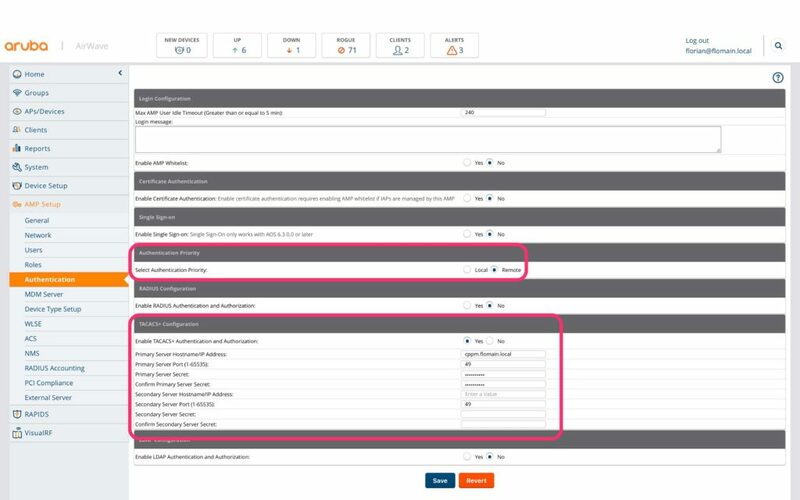 Select the “TACACS+ Based Enforcement” as the “Template”. As I create a profile for root access, a name it accordingly. The tricky part is at the bottom. Select the created device group in the “Device Group List”. This ensures, that this profile is only used for devices which are in this group. This makes life easier later on. Click “Next” to get to the next screen. Select the “Privilege Level” for the user. In my case, it is 15 for read-write with full access. Also select “Shell” for the “Selected Services”. In the “Service Attribute” section you can specify different options for each selected service. I set the privilege level to 15 again. Click “Next”, to get to the next screen. On this page, you can specify which commands are allowed for the user with this profile. In my case, I do not restrict the commands for this profile. I will cover this in a later post, as this is part of command authorization, which is a different topic. Click “Next” to get to the summary screen and save the configuration. You should repeat those steps for every profile you need. Normally, at least one time to create the read-only profile. The next step is to create the policy, which will assign the profile. The profile is assigned, based on user roles. 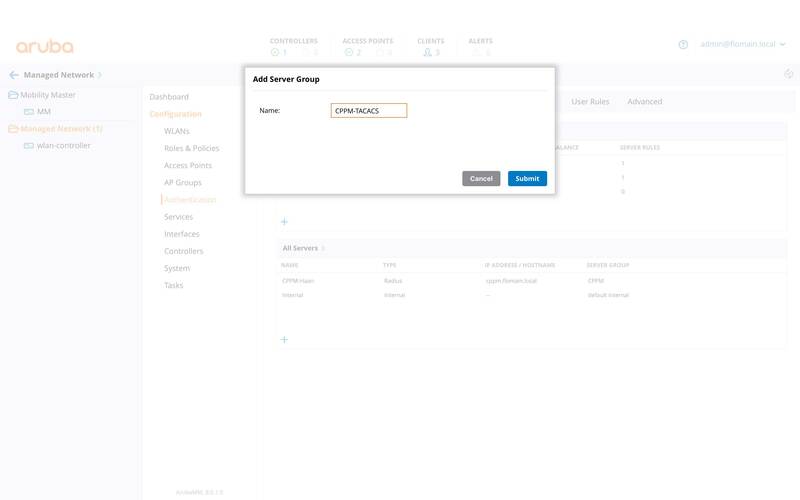 In my example, I have a local user configured which has the network administrator role assigned. Based on this role, the “Comware Read-Write” profile is assigned. You can add more rules if needed. If all rules match, the “Enforcement Profile” on the bottom is used to send the reply to the device. If you add more devices which need different profiles, you can simply add them to this list. As with the grouping function, only profiles which match the group, the device is part of, are used to send the answer. This makes it very easy to manage those rules. Click “Save” to save the rules. Add more rules, e.g for the read-only roles and accounts. Afterward, click the “Next” button and check the configuration on the “Summary” page. Then save the policy. 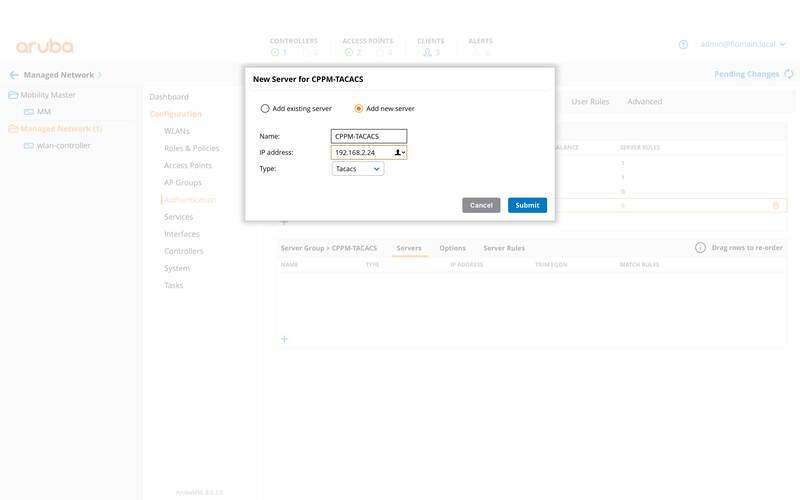 The following paragraph describes the configuration of the ArubaOS switch to support TACACS+ on ArubaOS based Switches and the additional configuration tasks for ClearPass. The end of both commands defines the authentication method. 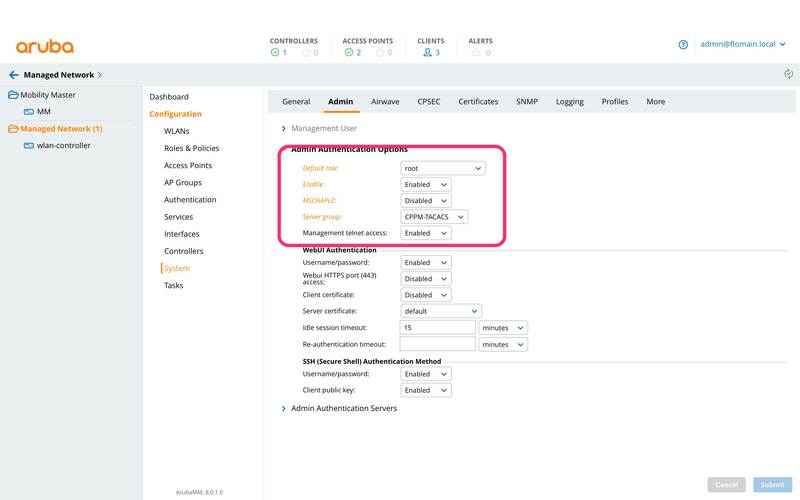 It is best practice to define local as the second authentication option, in case the TACACS+ server is not available. This ensures that access to the device is always possible. Repeat this command for every TACACS+ server you have. 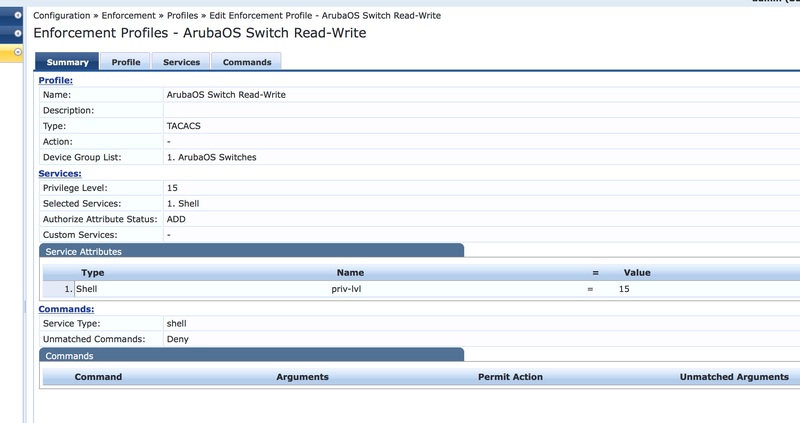 Afterward, the authentication for ArubaOS switches should work. Select “Remote” for “Authentication Priority”. The local account will always be accessible. This makes sure, that you can log in, even when the TACACS+ server is not available. Also, configure the details for the TACACS+ server. Afterward, click save to apply the settings. That’s all on the AirWave part. As the service, select “AMP:https” for this profile. For full access select the predefined “Admin” role. 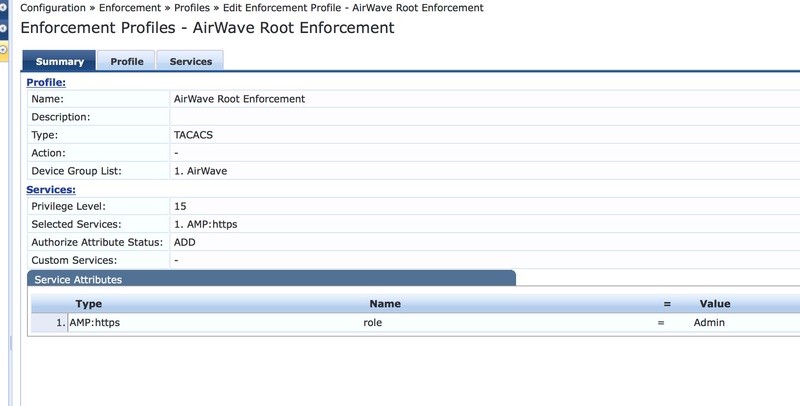 You can also use any other role name, previously defined in AirWave. 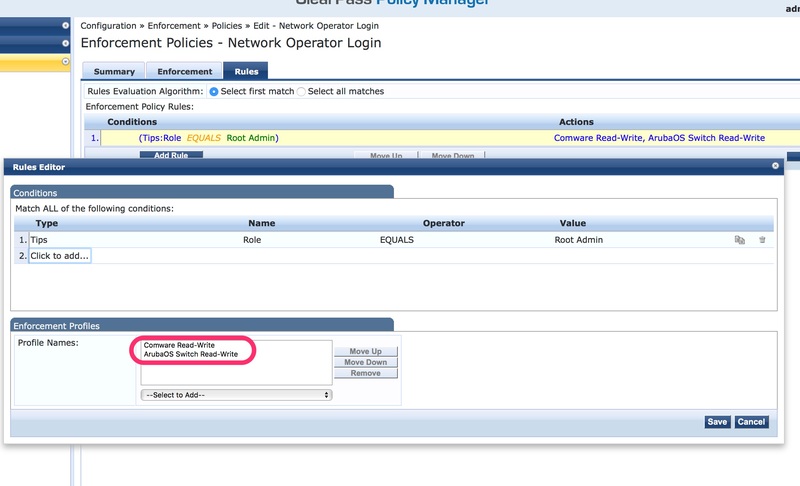 Add the profile to the previously used policy and you can use TACACS+ for authentication on your AirWave server. 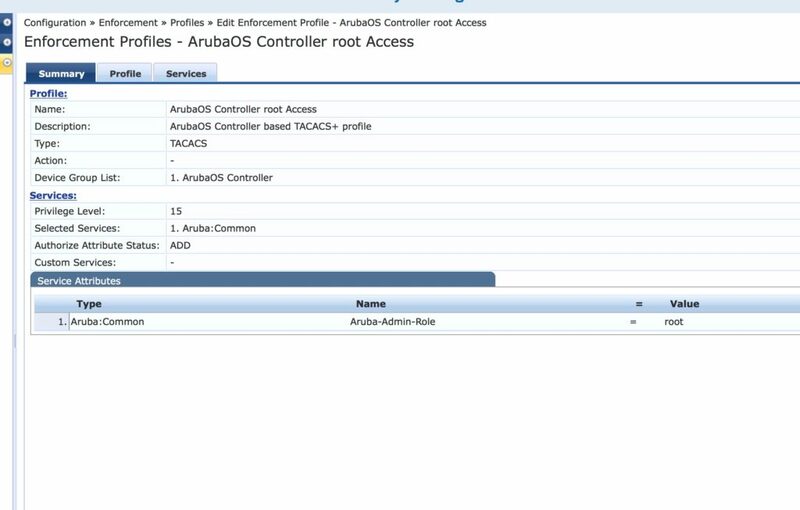 ArubaOS for WLAN controller supports TACACS+ as well. For this test, I use the brand new ArubaOS 8 version. Submit the changes and deploy the changes to all nodes. The important options are those within the red square. The default rule is used for authentication request where no rule is returned. Do not use MSCHAPv2 with TACACS+, as this will not work. The rest is self-explaining. Submit the changes and synchronize them to all nodes. 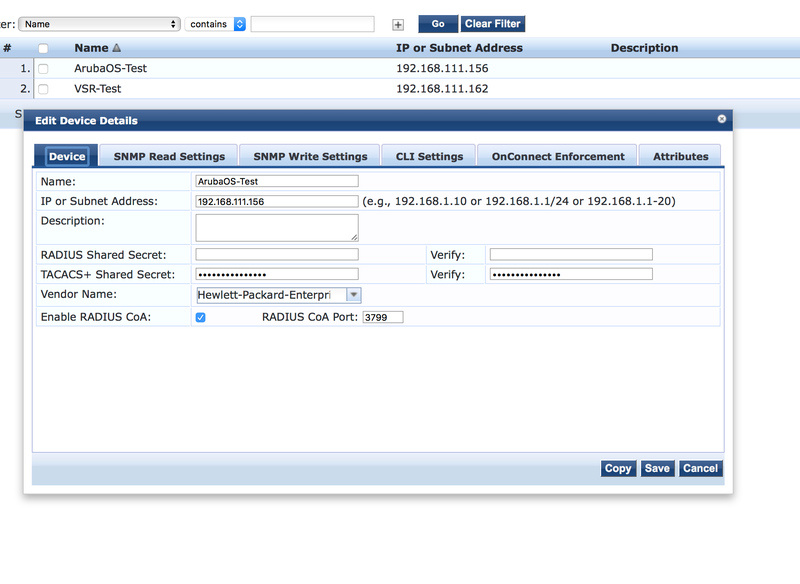 That’s the configuration and afterward, log on using TACACS+ should work. That post includes a lot of examples on how to use TACACS+ for operator login. In the next post, I will concentrate on authorization after the login. Feel free to write me your opinion below as a comment. I appreciate any discussion about the topic.